Did Shrek the Third imply that Snow White and Dopey are married? 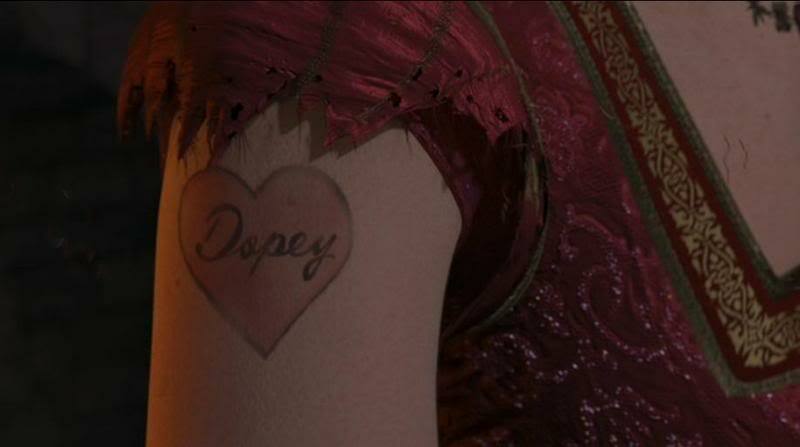 In Shrek the Third, when Snow White pulls off her dress sleeve, you can see that she has a heart tattoo with Dopey’s name in it. Does that mean they’re married? The implication, at least according to the actress that portrays Snow White (Amy Poehler) is that she and Dopey were in some sort of sexual relationship, but one that stopped short of marriage. Amy: So it was an empowering moment when the princesses literally burn their bras. We do that, don’t we? Maya: There is a little bit of that. Amy: And I have a "Dopey" tattoo. Snow White’s got a past. There are numerous cases of people in real-life with names in hearts which don't indicate marriage. A classic case is the (often seen in cartoons) heart with "Mom" inside of it, and not worn by Oedipus. The Shrek wiki notes it might mean they're married, but it's a user-editable wiki and they provide no citation. Not the answer you're looking for? Browse other questions tagged shrek or ask your own question. How does Shrek's rescue party reach him so fast at the end of Shrek 2? Why wasn't Donkey afraid of Shrek? Evil Queen - Good Queen? Is Prince Charming calling the Evil Queen “Wicked Witch” a reference to Disney's Snow White? Is the Puppet Master's name Stromboli in Shrek the Third? What kingdom was Farquaad’s mother Princess of?